Texprocess is the leading international trade fair for the processing of textile and flexible materials. 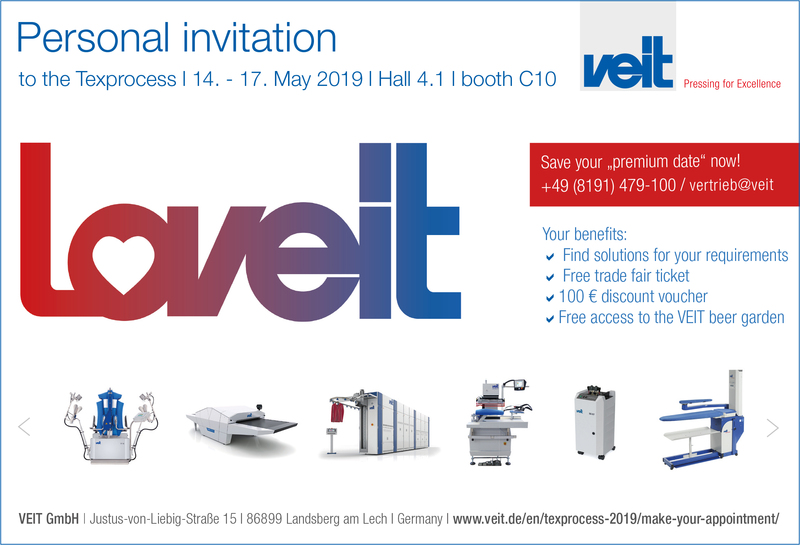 Please visit the VEIT Group at Texprocess 2019 in Frankfurt – Hall 4.1, booth C10 and save the date in your calendar. Save your premium date now! Please arrange your personal premium appointment now and secure a 100 € discount on the purchase of VEIT products (valid from a value of 300 €) and, if desired, a visit to the VEIT beer garden in addition to your trade fair ticket. LOVEIT (or LOVE IT) stands for the passion we put into the development of our products, the love for perfection and the dedication to our customers.